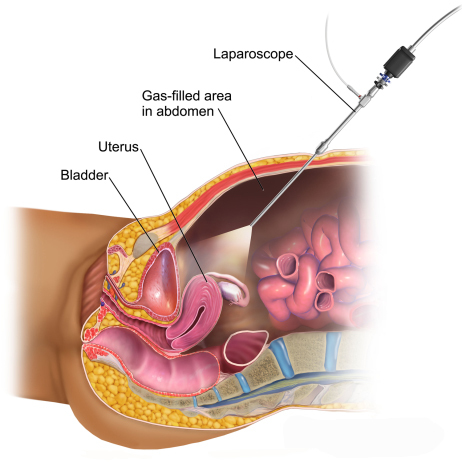 A Laparoscopic Hysterectomy is a minimally invasive surgical procedure to remove the uterus. A small incision is made in the belly button and a tiny camera is inserted. Dr. Patero watches the image from this camera on a TV screen and performs the operative procedure. Two or three other tiny incisions are made in the lower abdomen. Specialized instruments are inserted and used for the removal process. Some women do not have their ovaries removed when they undergo a hysterectomy. If the ovaries stay inside, the woman does not need to take any hormones after the surgery and she does not have hot flashes. Some women remove their ovaries because of family history of ovarian cancer or they have an abnormal growth on their ovary. Women can choose to either keep the cervix in place (called a “Laparoscopic Supra-Cervical Hysterectomy”) or remove the entire uterus and cervix (“total Laparoscopic Hysterectomy”). Keeping the cervix in place makes the operation a little faster and safer. When the cervix is in place there is a 5% chance that the woman will have monthly spotting at the time of her menstrual periods. Women whose cervices stay in place need to continue getting pap smears. If the woman wants to be 100% certain that she will never menstruate again, she needs to have the entire uterus removed. If the patient has a history of pre-cancerous changes of the cervix or uterine lining, she should have the entire uterus removed. If the operation is being done for endometriosis or pelvic pain, many doctors think the chances for pain reduction are better if the cervix is removed.